Watergeneral reverse osmosis water treatment systems use the most advanced water purification processes for drinking water. The same purification processes used by bottled-water companies. This technology is now available to homes and offices at affordable prices. Watergeneral RO systems are designed and manufactured to meet and exceed National Standards. 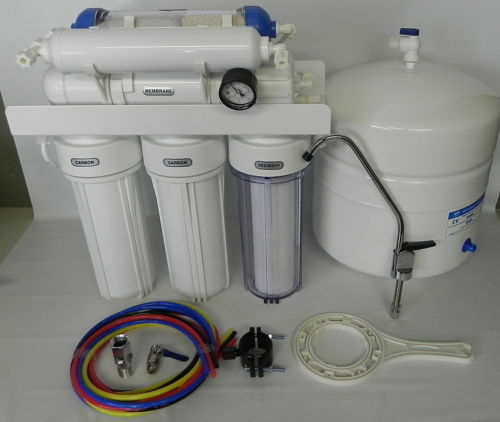 The quality and performance of our reverse osmosis systems are guaranteed. Capacity: 50-85 gallons per day (actual production rate depends on input water pressure, temperature and water chemistry) the system is a complete system for under-the-sink installation. Usage: for both city water and well water. 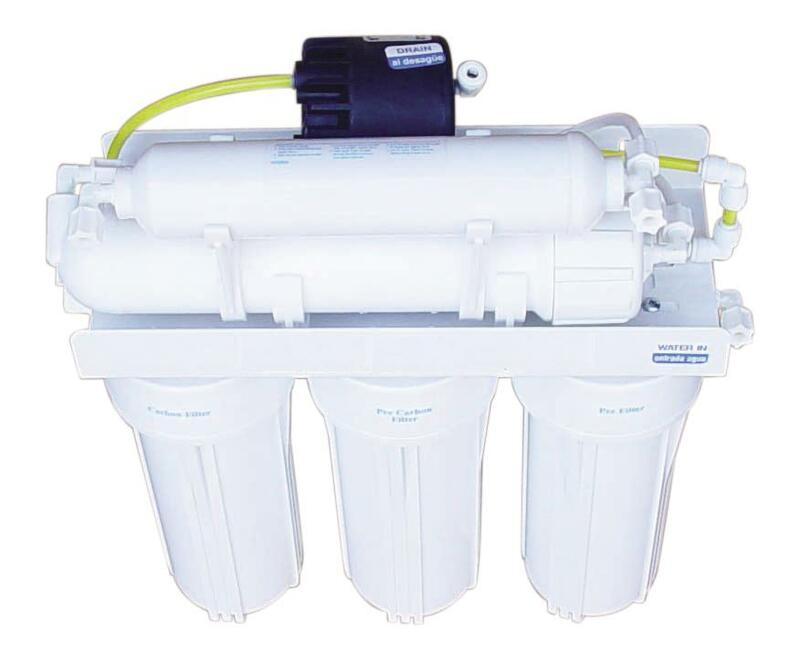 Permeate pump is a mechanical pump that uses drain water pressure to boost up input pressure. No electricity is required. Booster pump is a diaphragm pump which uses electricity. The pump system includes, pump unit, transformer, solenoid valve and pressure switch. 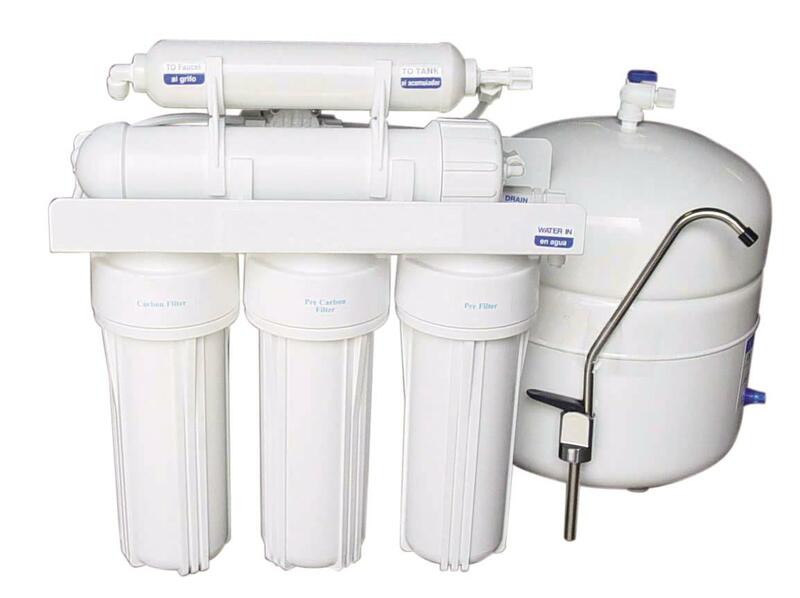 Includes: RO unit with all filters, pressure tank, dispensing faucets, tubing, installation hardware Usage: for both city water and well water. This table is provided by membrane manufacturer, for reference only, actual rejection depend heavily on the exact chemistry, temperature, pressure, TDS content of the feed water. 2nd stage: carbon block filter, removes chlorine, bad taste and odor. 4th stage: Reverse osmosis membrane, pure H2O is extracted and other dissolved solids are rejected to the drain. 92% to 98% rejection rate. 5th stage: inline carbon filter, improves taste of water. Easy installation: Under-the-sink installation: the system comes with adapter for under-the-sink installation. We use high capacity filters and membranes to ensure reliable performance of our RO systems, thus you save time and money on filter replacements. RO-585, 5-stage filtering process, capable of producing 40 to 85 gallons per day. It is designed to be used for both municipal city water supply and well water supply. Actual production rate depends on water pressure, temperature, and water chemistry. The automatic shut-off valve will turn off the water input when the storage tank is filled up, so you save water from going to the drain.